A November meeting of the Human Exploration and Operations Mission Directorate (HEOMD) Advanced Exploration Systems division has discussed the progress made in Fiscal Year 2015 and upcoming FY16 milestones surrounding the development of long-duration habitats needed for astronauts on missions from cis-lunar flights to multi-year trips to Mars. Overall, the Advanced Exploration Systems (AES) division established 72 milestones for Fiscal Year 2015 (FY15). Of those milestones, over 60% included flight demonstration elements, according to the HEOMD AES status update. Of the 72 milestones established, the AES defined an achievement goal of “at least 80%”. In total, 56 of the 72 milestones were met, a 78% achievement rate. The 56 accomplishments were overseen by 572 civil servants and 162 contractors. Some of those accomplishments met the habitation systems requirements to provide crew a space to “live and work safely in deep space, including beyond earth orbit habitats [with] reliable life-support systems, radiation protection, fire safety, and logistics reduction,” notes the HEOMD AES presentation. Furthermore, the AES presentation notes that deep space habitation modules must be capable of supporting crew with “systems sufficient to support at least four crew on Mars-class mission durations and dormancy” lasting 1,100 days. With numerous tests, validations, and verifications of habitat structures and systems already carried out on Earth, the Bigelow Aerospace company completed a major effort in FY15 to deliver an in-space test article to the Kennedy Space Center in the form of their Bigelow Expandable Activity Module (BEAM) – which will be installed on the International Space Station next year. 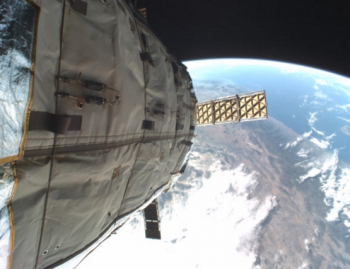 The BEAM is set to launch on the SpaceX-8 mission, currently targeting launch in January 2016. To facilitate NextSTEP, NASA awarded four contracts in FY15 for participation in the habitat concept development part of their NextSTEP Commercial Habitat Concept Studies program. NASA further awarded three contracts in the study to specifically address habitat Environmental Control and Life Support Systems. For FY16, activities surrounding AES habitat development will include BEAM’s launch to the ISS as well as the completion of subsystems for the VASIMR test article in August 2016, part of the NextSTEP Commercial Habitat Concept Studies program. If the current schedule holds, September 2016 will see the completion of the Habitat Systems Concept Studies program, though additional follow-on contracts may be awarded. Advancing the evolving nature of NASA’s relationship with its commercial partners, the NextSTEP habitation systems program was “implemented to identify potential public-private partnerships on habitation systems that can leverage existing or planned commercial systems and activities to perform NASA proving ground objectives,” notes the AES presentation. 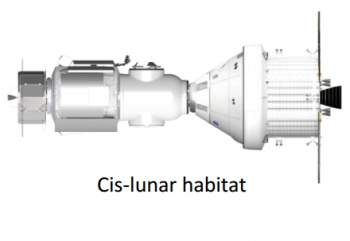 Specifically, the program is designed to develop concepts and technologies relating to a near-term need for crew habitation for cis-lunar missions – with an eye toward eventual extensibility of that developed technology for long-duration missions. 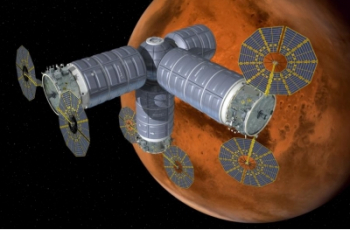 In short, NASA is looking for a way to leverage current and near-term technologies in a gradual implementation buildup toward the habitation needs of the 2030s and 2040s human missions to Mars. 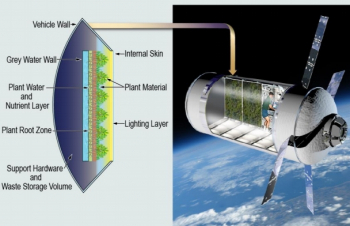 As such, missions to the International Space Station and areas of space near the moon will provide the habitation foundation upon which deep space habitation technology is developed. In total, four companies – Lockheed Martin, Bigelow, Orbital ATK, and Boeing – were awarded contracts to address habitat concept development. 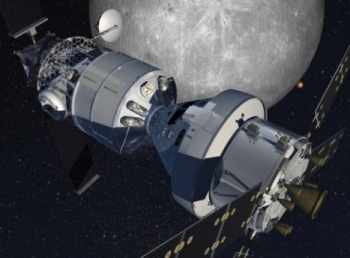 Lockheed Martin is focusing on a habitat that will aid the Orion crew exploration vehicle’s capabilities and will draw significantly on heritage designs from Lockheed Martin products as well as Thales Alenia’s heritage designs for habitation and propulsion. Thales Alenia Space has extensive experience with habitat module design as they were the prime designers and producers of the MPLMs (Multi-Purpose Logistics Modules) for logistics runs to the Space Station during the Shuttle era as well as the builders of the Columbus module for ISS and the ATV ICC (Automated Transfer Vehicle Integrated Cargo Carrier) pressurized cargo modules as part of ESA’s resupply initiatives for the ISS. Lockheed Martin will take primary point on the design analysis cycle and trade studies as well as “provide systems engineering and integration,” notes the AES presentation. 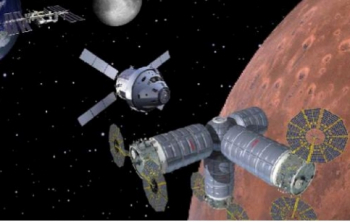 Lockheed Martin plans to accomplish this by – in part – using heritage subsystems from the Orion capsule itself to help reduce the cost of the initial habitat design. Similarly, Bigelow will leverage past mission success with their prototype BEAM habitats to offer NASA extensible options for a range of missions from LEO to beyond cis-lunar objectives. 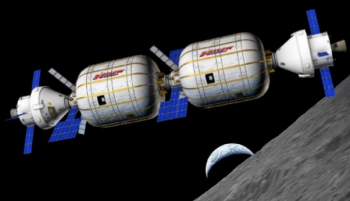 Bigelow’s proposal for an Exploration Habitat Module (EMH) focuses on the company’s experience with two prototype expandable habitat spacecraft that were successfully deployed and operated in Earth orbit. According to the AES presentation, “Bigelow Aerospace will produce a conceptual study illustrating how its B330 habitats can be used as the EHM. Genesis I was launched on 12 July 2006 from Dombarovskiy missile base near Yasniy, Russia on an ISC Kosmotras Dnepr rocket. Genesis II followed on the same type rocket from the same launch facility on 28 June 2007. As part of this plan, Orbital ATK has laid out eight items that define their objectives and technical approach to the program, including concept development for their EAM, identification and development of a functional configuration baseline for “evolvable exploration augmentation modules,” and performance of EAM requirements trades. Furthermore, Orbital ATK will identify key EAM subsystems that will be needed for long-duration missions throughout the solar system. Finally, Boeing’s proposal for the program focuses on three areas: definition, testing, and validation of hab system concepts and supporting systems; a modular design to increase capabilities toward long-duration missions; and the combination of commercial and government exploration capabilities. To this end, Boeing’s plan is to develop a “simple, low-cost habitat that is affordable early on, allowing various technologies to be tested over time, and that is capable of evolving into a long-duration crew support system for cis-lunar and Mars exploration,” notes the AES presentation. 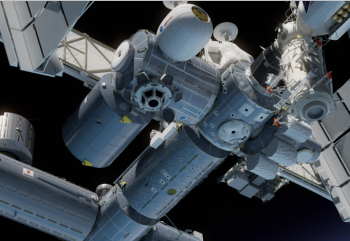 Nonetheless, development of the physical architecture for habitat modules will not account for everything NASA hopes to gain from the Habitat Systems Concept Studies program. To that end, NASA has contracted with three additional companies for the express purpose of addressing the needs for the environmental control and life-support systems (ECLSS) that will be needed on these habitat modules. One of these companies, Dynetics, is exploring the idea of a miniature atmospheric scrubbing system that would involve “testing a tabletop miniature separations system” under laboratory environment conditions to test the miniatures’ ability to remove carbon dioxide from the air. 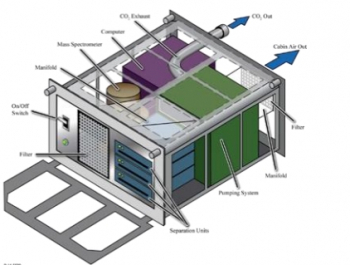 The idea of this study is to maximize the efficiency of carbon dioxide scrubbers while reducing the overall amount of physical space that kind of system requires. This proposal brings the potential benefit of streamlining crew knowledge and maintenance/repair of the ECLSS by utilizing common components across all of the subsystems, therefore reducing the number of spare parts needed on orbit or during transit for long duration missions. However, the Orbitec company won a third contract award for this part of the program due to their proposal for a hybrid life support system. Orbitec’s proposal would see the integration of already established and tested physical-chemical life support systems with bio-production systems. According to the AES presentation, this kind of life support system would “enhance exploration environmental control in life-support systems” by finding an optimal mix of bio-production and physical-chemical technologies based on mission design and parameters. Regardless of the outcome of this program and whether or not NASA options potential follow on contracts for additional study, the agency continues to demonstrate its commitment to a staged approach for not just the overall mission of a human flight to Mars but also in the technology that needs to be developed prior to undertaking such a commitment.